It wasn't long ago that the mention of "Korean BBQ" elicited a brow furrow and a Google Image search. Nowadays, the masses are better informed: KBBQ = a social, booze-filled dining experience in which diners grill different cuts of meat themselves over a tabletop grill, to be enjoyed with complimentary sides. Restaurateurs have also caught on, with affordable, upscale, and novel takes on the menu and atmosphere that defy and redefine the sometimes pricey, roll-your-shirtsleeves eating ritual that has nearly reached Indian food's ubiquity. From a spot on the 39th floor of a K-Town skyscraper, to several 24/7 joints, to a restaurant co-owned by Quentin Tarantino, it's a choose-your-own-adventure world in today's KBBQ. Get to exploring. It's Jean-Georges' favorite KBBQ place in K-town, but that's not why you should pay a visit to this 24/7 spot. First, there's the pork belly, cut into greasy, thicker-than-average strips. Then there's the restaurant's best-selling kimchee pork backbone stew -- a steaming pot of spicy red soup bubbling with generous helpings of kimchee and fall-off-the-bone pork backbone. A single $17 order will easily fill three people. And about that kimchee: Muk Eun Ji offers an aged version that's imported from Korea two to three times a year in 12-ton, 20ft containers. This variant (different from the free banchan kimchee given to all patrons) has a darker hue and more garlic-and-pepper bite sealed into the cabbage. For the ultimate flavor rapture, advises Chefs Society editor and Korean Cultural Ambassador Seolbin Park, grill your aged kimchee with the pork belly, and eat cuts of both in a single bite. 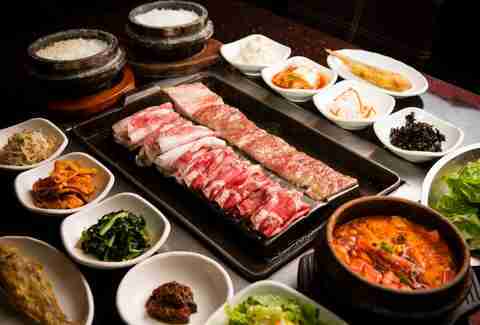 If you're willing to pay slightly more, Shilla will give you one of the best KBBQ experiences in New York City. The pork belly is much-lauded here, and comes with extra-plentiful banchan (side dishes) that include kimchee, bean sprouts, egg, and a fried Korean pancake. The tabletop grilling service requires a minimum of two meat selections, but with the aforementioned fatty pork belly on offer, as well as exceptional kalbi and sweet, marinated bulgogi options, you'll be wondering about the maximum. Located outside the last stop on the 7 line, Mapo Galmaegi is the ideal restaurant for inexperienced outer-borough adventurers. Travelers reward themselves here with galmaegi (pig rib meat) -- the restaurant’s signature, namesake dish. And if you're looking for the classics, most other beef and pork cuts like marinated short rib (galbi) and thin slices of brisket are available, as well. Oh, and because the practical folks behind Mapo know you'll be indulging amongst meat fumes for a while, they've cleverly furnished all tables with chairs that double as storage. This way, your happy dining memories can live on in your social media, and not on your clothes. Good and buzzy enough that food-world luminaries David Chang and Rich Torrisi have dined there together, this South Korean chain -- opened by a wrestler-turned-comedian -- planted its US flagship in the heart of Koreatown, where Momofuku vet Deuki Hong adds fine-dining finesse to BBQ staples like kalbi (beef ribs) and bulgogi (soy-marinated sirloin). Family-style meals and in-house karaoke rooms -- it's a concept more restaurants should consider, and one that Insa has adopted in a trendy Gowanus KBBQ spot. Not that one wouldn't come here for the food alone: From the addictive starter eats (like fried beef dumplings and blood sausage dipped in perilla salt), to the mixed rice and pork stew dishes, there's not a single item you wouldn't want seconds of. In fact, KBBQ may make up less than a quarter of the menu, but more than enough other carnivorous options make this a dismissible fact. As for the karaoke, it's offered in five themed rooms, from "jungle" and "deep sea" to "space" and "psychedelic." 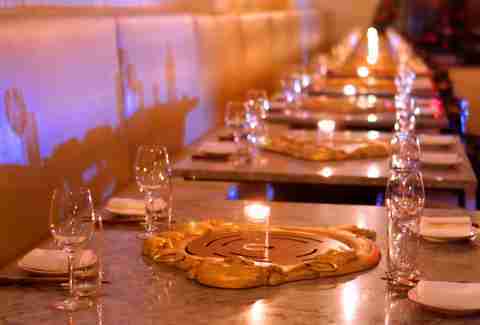 So, we know you've already got your next birthday venue locked down. It's pork belly or bust at this 'cue and cold noodle specialist, where the slabs of swine get a superior char thanks to a fancy, crystal-topped grill. Unconventional marinades (think green tea) can be found here as well, but get the simplest preparation (with no seasoning at all) if you want to savor the porky glory. 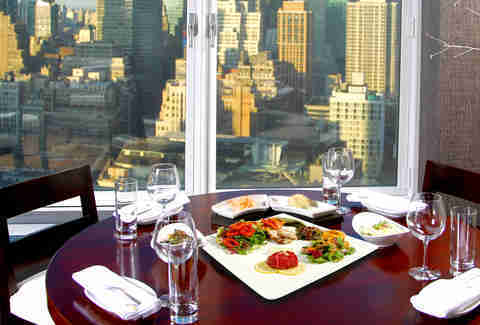 Located on the 39th floor of a towering K-Town skyscraper, Gaonnuri impresses with both its insane city views and heaping plates of garlic-and-soy-soaked short ribs and succulent duck breast, accompanied by standout banchan (basically free side dishes) like kimchee and fermented squid. Spring for an LIRR ticket to get to this far-out hole-in-the-wall spot, where you'll use enormous dome-shaped grills to sizzle up nuggets of pork belly (some of the best in the city) and veggies, and then wrap them in lettuce cups to form flavor-packed bites. Anthony Bourdain and David Chang may have highlighted this restaurant's still-alive octopus dish, but the non-squirming meat dishes pack just as much, if not more, flavor. The requisite order here calls for spicy marinated pork -- which promises an addictively sweet-piquant experience -- and twisted galbi. Offering a textural change from the classic marinated beef short rib item, the galbi pairs swimmingly well with littleneck clam BBQ -- so you can taste Sik Gaek's seafood renown while getting your warm-blooded fix. 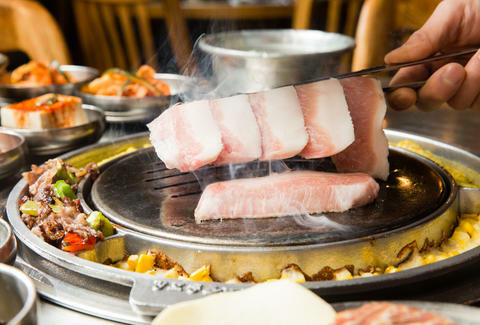 There are more than a dozen cuts of meat to choose from at this Queens BBQ shrine, ranging from your usual suspects (bulgogi, kalbi) to some less routine stuff (pork neck, blowfish), but pork belly -- seasoned generously with sea salt, then scorched until a caramelized crust forms -- is the true star. This sleek, dark wood-paneled go-to, outfitted with sunken booths and a wine bar up front, is always reliable for platters on platters of tasty DIY kalbi and pork belly, plus seafood hits like scallops and tuna. Ask any Korean in their 20s to name their go-to KBBQ spot, and they'll point to Jongro. A regular stop in the late-night K-Towner's Saturday night, Jongro is a not-so-secret second-floor restaurant more for eating and imbibing than for sitting down with the family. 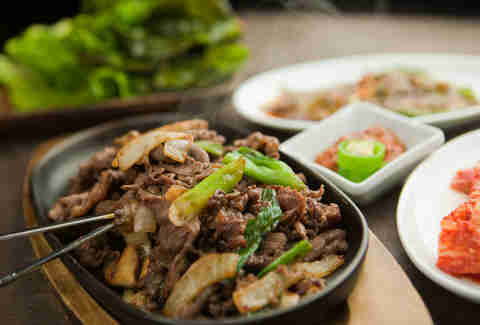 Brisket, Korean marinated short ribs, and skirt steak are the centerpiece foods here, but orders of spicy rice cakes, kimchee stew, and thick fried seafood pancakes can also be seen at almost every other table. The high-capacity space makes it the ideal group destination, so roll in with your six favorite friends, plus an appetite for soju. Don't be surprised if you spot Quentin Tarantino chowing down on kalbi here. The Kill Bill director teamed up with mother-daughter team Myung Ja Kwak and Jenny Kwak to bring Korean home cooking Downtown, where they offer a $35-per-person tasting menu that includes popular dishes like pajun (seafood pancake) and spicy bulgogi. 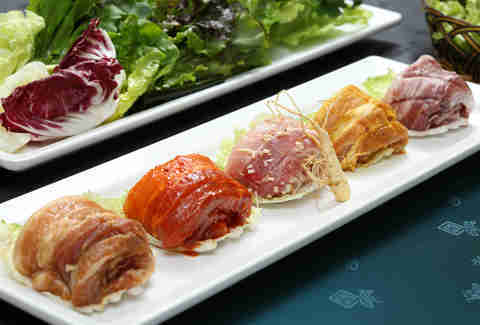 Grilled items can also be ordered a la carte and arrive with lettuce to be eaten ssam-style. BYO fast-paced, quirky, and semi-obscure dialogue. Mapo is one of the few NYC spots doing Korean BBQ the old-school way: by searing meats over burning charcoal. The marbled, size-of-your-face kalbi is cooked as a whole slab, then snipped into a heap of juicy, charred cubes. Get your KBBQ fix any time of the day at this 24/7 joint, where there's an emphasis on high-quality beef and employing both wet and dry methods to age the meat. Don't miss the signature clay pot kalbi -- the beef short ribs marinate in the special vessel for a whopping 48 hours straight. 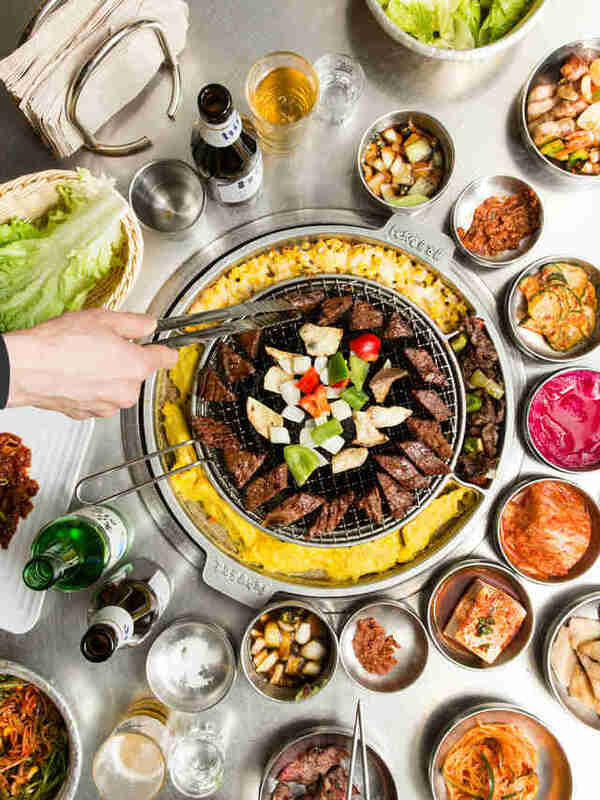 Sam Sifton called Madangsui "Manhattan's best Korean barbecue restaurant" when he reviewed it in 2009, and while we won't confirm that early-KBBQ-era declaration, Sifton is accurate with his ordering suggestions: Get a round of all the BBQ classics, including the rib-eye, pork belly, and galbi. The humble fried mandu are notable too, and go well with an order of japchae, or sesame oil stir-fried glass noodles. First it was hole-in-the-wall joints, then food carts and fast-casual concepts. 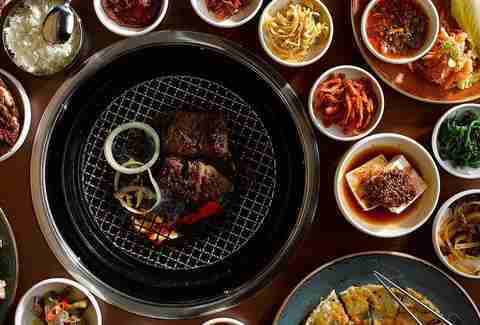 Now, KBBQ can also be found at a high-end restaurant backed by Korean music mogul J.Y. Park and Lil Wayne's business manager, Horace Madison. The grillable meats list here is thinner than at other places -- offering but 10 cuts of meat -- but in keeping with the pinky-up theme, a list of a la carte meat entrees, including a bibimbap (rice dish) made with wagyu tartar, generously satisfies. If you opt for the former option, you can grill your pork belly on a crystal surface which purports to cook meat faster and more evenly. It's not the traditional, no-frills KBBQ experience, but if you're the kind of person who likes their fried chicken served on a bed of lemon dill kale, and want a place to eat your favorite fare while wining-and-dining your first date, then this is the spot. Michelle No is a former production assistant at Thrillist and she misses LA's $16 all-you-can-eat KBBQ deals. Follow her on Twitter @Michelle_No and Instagram @MichelleNope.